As of January 31st, it appears that Apple has blocked both Java 6 and Java 7 Update 11 from running in Safari. Update 1 – February 1, 2013: Oracle has released Java 7 Update 13 to address the vulnerabilities in Java 7 Update 11. Once Java 7 Update 13 has been installed, Safari will no longer block the Java plug-in on 10.7.x – 10.8.x. Update 2 – February 1, 2013: Apple has released Java for Mac OS X 10.6 Update 12 to address the vulnerabilities in Java 6 on 10.6.x Macs. Once Java for Mac OS X 10.6 Update 12 has been installed via Apple’s Software Update, Safari will no longer block the Java plug-in on 10.6.x. 1. Open Safari on a Mac running 10.6.x or higher. 2. 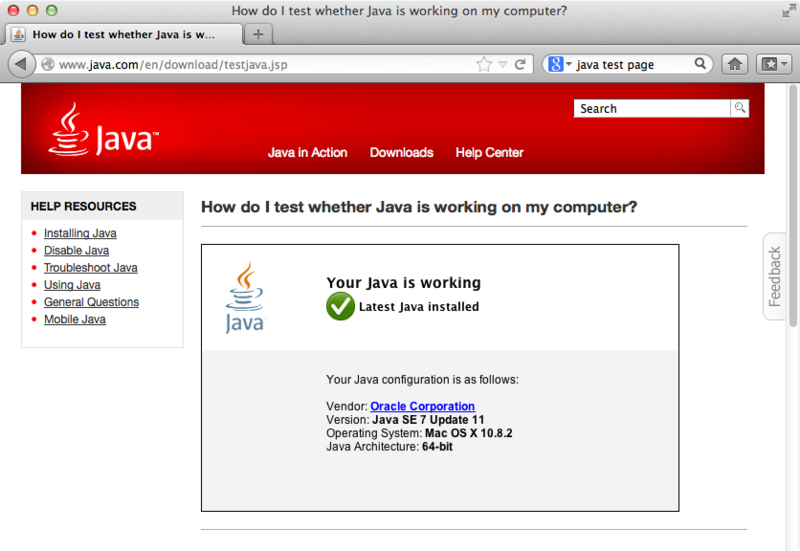 Go to http://www.java.com/en/download/testjava.jsp to test your Java browser plug-in. 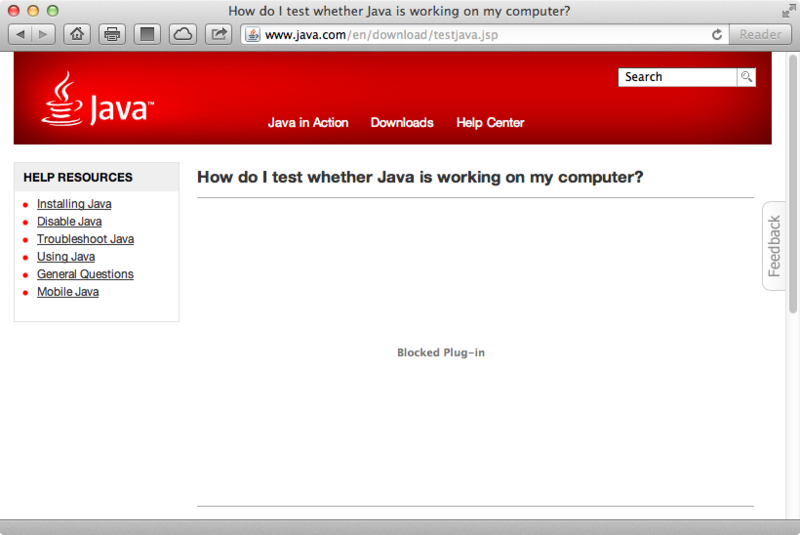 Instead of a report that Java is working, you’ll receive a Blocked Plug-In message. The best workaround at this time is to use Firefox. I tested with Firefox 18 and Firefox is not blocking the Java plug-in at this time. Java 6 on 10.6.x: Apple has released Java for Mac OS X 10.6 Update 12 to address the vulnerabilities in Java 6 on 10.6.x Macs. Once Java for Mac OS X 10.6 Update 12 has been installed via Apple’s Software Update, Safari will no longer block the Java plug-in on 10.6.x. The plugin version installed by Apple is 1.6.0_37-b06-434. The plug-in blacklist is specifying that 1.6.0_37-b06-435 or higher is required, so 1.6.0_37-b06-434 is being blocked automatically. The plugin version installed by the current Oracle Java 7 Update 11 installer is 1.7.11.21. The plug-in blacklist is specifying that 1.7.11.22 or higher is required, so 1.7.11.21 is being blocked automatically. I’ve updated the FileVault 2 status check scripts so that they’re now able to correctly handle unencrypted Fusion drives. The scripts should now report accurately on 10.8.x Macs that use Fusion drives, as well as other 10.7.x and 10.8.x Macs. After recently participating in a discussion about disabling the Sleep command in the Apple menu, I wanted to document how to do this. This may be most useful for Mac terminal services, which was the context where I learned how to do this. 3. 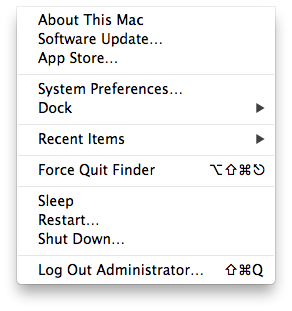 You should see that the Sleep command is now grayed-out in the Apple menu. 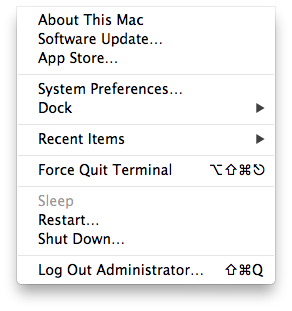 After the restart, you should see that the Sleep command is available again in the Apple menu. I’ve made some updates to the daily server report scripts that I host on my GitHub repo, as I recently tested them on 10.7.x and 10.8.x Server. The existing 10.5.x – 10.6.x script runs fine as-is on 10.7.x Server, but I needed to make a few changes for 10.8.x Server. 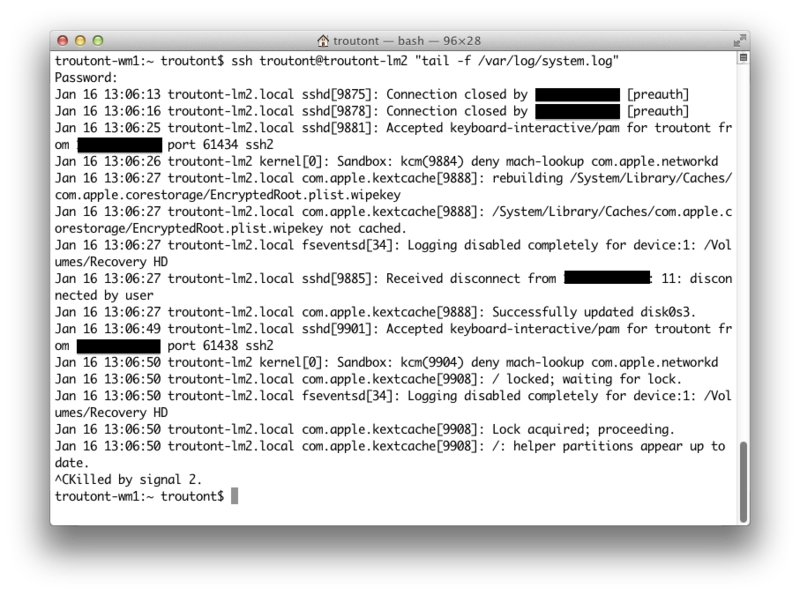 In 10.8, /var/log/secure.log‘s functions have been moved to Apple System Log. The script is running syslog -k Time ge -24h | grep 'sshd' to check ASL for SSH activity in the last 24 hours. The SSH activity is exported to /private/tmp/ssh-status.txt, then ssh-status.txt is scraped for SSH errors. When new software appears, Mac admins need test boxes that match their standard configuration in order to verify that the new software doesn’t adversely affect anything in their environment. In the past, this has usually meant that admins needed to either have an available test box, or go find one when they needed to test something. The advent of good virtualization solutions meant it was easier to build test boxes without needing additional hardware, but getting the VM to match your standard could take some time and effort. In VMWare Fusion 5.x, VMWare added NetBoot support for virtual machines running Mac OS X. This proved to be an enormous boon to Mac admins who used NetBoot to help set up their machines: They could now build VMs using the exact same processes that were used to build their users’ Macs. They could also leverage tools like createOSXinstallPkg to set up template VMs with either the latest available OS X installer from the Mac App Store or custom builds of OS X that ship with new hardware. See below the jump for an example of how you can leverage VMWare’s NetBoot support, createOSXinstallPkg and DeployStudio to set up a new Mac VM with a factory-fresh install of OS X Mountain Lion. One thing I’ve wanted to do for a while is virtualizing my home server setup, as well as making it easier to stand up (and take down) test servers as needed. I’ve been doing a lot of work with VMWare Fusion on my Mac and could have gone that way, but I wanted to do the virtualization with VMWare’s free ESXi software. I hadn’t previously set up a dedicated hypervisor, so I wanted to learn how to do that. I have a 2011 Mac Mini Server, which is fortunate because setting up ESXi on that Mini model has been well-documented in a number of places. The latest available version as of this date is ESXi 5.1, so I decided to install that. After some work, I now have ESX 5.1 running on my Mini Server. See below the jump for the details. On occasion, I need to run a single remote command on a single system, but don’t have a tool handy (like Apple Remote Desktop’s Send Unix function) to do it. If the machine in question has SSH enabled though, there’s a simple way to do this. ssh username@server.domain.com "your command here"
ssh username@server.domain.com "tail -f /var/log/system.log"
You’ll be prompted for a password, which will be used by SSH to log into the remote system. If the password is accepted, tail should start displaying the latest entries to /var/log/system.log as they’re written. To stop, you would hit Control-C as usual. That will stop the command’s execution and close the SSH connection automatically. When running commands that require elevated privileges, you’ll need to add the -t flag to your SSH command. -t tells SSH to force pseudo-tty allocation, which in turn provides a way to feed your account’s password to the remote server and run the command via sudo. ssh -t username@server.domain.com "sudo killall opendirectoryd"
You’ll be prompted for a password, which will be used by SSH to log into the remote system. You’ll then be prompted again for a password, which will be used by sudo to authenticate that your account is authorized to run the command with sudo. Once the command is run and completes successfully, the SSH connection closes automatically.